Since Rebecca at Love at First Book posted about her plans to give copies of Jamie Ford’s Hotel on the Corner of Bitter and Sweet out during World Book Night, I’ve wanted to read this book! I very much enjoyed reading this book, and it opened my eyes to various ideas and issues that I had not taken the time to consider before. 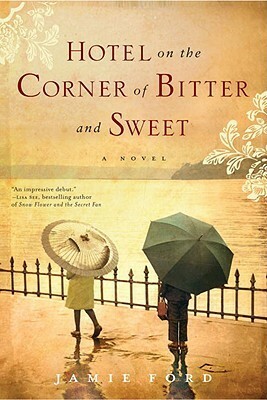 Hotel on the Corner of Bitter and Sweet is a story about love, and love lost. A love that is deep, loyal and true. A love that is intense. Maybe two intense for such young people to handle. It is also one look at the upheaval and devastation caused by the evacuation of all people of Japanese heritage living in America, whether immigrants or Americans. What exactly happened to Japanese people in America after the attack on Pearl Harbour in 1941? In my mind, I also made the jump over to, how did America behave differently or similarly, or better, after the 9/11 attacks in New York? Retaliation shall remain outside the realm of this discussion on both of these situations. Can you imagine removing the entire population of an ethnic group from a country as vast and populated as the United States? I don’t know how they did it. It must have taken a huge amount of coordination and man-power to evacuate, transport and care for (if you can call it that), the Japanese people at that time. There were over 120,000 of them and there were camps all over the country, you can see a map here. I won’t even get into the ethical issues here, but sufficed to say that it is a very sad, sad part of history. A part that I feel I should learn more about. And do we learn from history? Maybe…. sometimes? While Muslim people in the States weren’t rounded up after September 11, 2001, they were, and are, certainly openly profiled, discriminated against and treated as suspect by various government related agencies (such as border patrol), organizations, and individuals. A study completed in 2012 entitled Attitudes Towards Muslim Americans Post-9/11 cited at 1700% increase in hate crimes in the aftermath of the attacks. However, the study also concludes that over time there is not a significant rise in overall negative attitudes towards American Muslims. So, it appears that as time passes, things have returned to pre-attack levels. I am not if in practice this is true, but I have limited experience, which is mostly regularly trying to cross the Canadian border to the US with Middle Eastern friends in tow, versus crossing with only caucasians. We have a much greater benefit of time when we look at the impacts of the response towards the Japanese Americans in the 1940s though, and overall we can see that there is no longer the fear and mistrust that there once was. Even in the book’s later timeline of 1986, this attitude is no longer expected or prevalent in society. This entry was posted in What to Muse about life and tagged 9/11, America, book recommendations, Japanese, Love, Muslim, Pearl Harbour, reading, War. Bookmark the permalink. This has been on my bookshelf for a few years and I don’t know why I haven’t gotten to it. Thanks for the review – looking forward to reading this! Thanks for a thoughtful review. I really appreciate how you’ve linked the themes of the book with current issues. I keep telling myself I’ll read this in a trio with Julie Otsuka’s When the Emperor Was Divine, another take on this issue, and the classic Obasan by Joy Kagawa, which looks at how this same sentiment played out in Canada. Maybe it will be a winter or spring project. Although I suspect it will be a depressing endeavor. Oh! And maybe Weedflower by Cynthia Kadohata, a YA title that covers the same territory but links it to the plight of Native Americans. You are welcome! I read Obasan as a teen and I’ve been thinking of re-reading soon, as I don’t remember much about it. This is a nice question. Whenever we are attacked, we always doubt everyone of the community of the attacker. Wow, this post is really great. It’s very interesting to take the book and discuss it as less than a review and more of a social issue, and it’s so valid and relevant as well. I think we’ve learned a teensy bit.. . but check out other countries. . . genocide has happened since the Holocaust in Darfur. . . racism/sexism still abounds even in the US. . . it’s a toughie! We’ve gotten better, but we’re not there yet. We still need work.